CHT has developed the “MEGA ARK FLEET” to be the most technically advanced fleet of horse transport vehicles in the country. 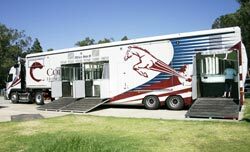 Specialising in long distance road transport, CHT ensures that every technique and facility is used to ensure the comfort of your horse, and minimise the effects of transit. In fact, most horses are performing at their peak soon after their journey. To enable us to achieve the highest levels of efficiency and comfort, CHT is meticulous in its attention to detail and service – from its vast transport network to the most experienced staff and advanced equipment . The latest addition to the CHT fleet, the “MegaArk III “, along with the company’s accreditation for Quality Assurance, provides clients with an absolute assurance of the highest levels of service, quality and safety.